Here at the Wooden Boat Centre one of the only things we enjoy more than building beautiful wooden boats is supporting others who hope to learn a little bit about our craft. We believe strongly that wooden boat building techniques are both relevant and under-appreciated in the 21st century and as such we make it our mission to provide a series of assisted boat building schemes in the hope of providing a selection of keen and engaged individuals with the opportunity to learn the basics of a discipline with a history longer than civilization itself. For those who would like to get their hands dirty and learn some skills but do not necessarily want a boat of their own at the end of the course. In a group build you will work with others to complete syndicate style boat project. Boats being built in these courses range from lightweight 10ft rowing skiffs to heavy build 18ft clinker launches. The length of the course is determined by the complexity of the boat being built and these courses run at demand-based intermittent intervals throughout the year. To learn more about upcoming group builds, head on over to the Workshops Page. For people who wish to build and take home a small boat of their very own. These classes focus on one specific boat, usually one of the kit boats designed and sold by the centre. The classes are based around completing of the basic structure of the boat with clients being required to take their boats home for painting and finishing. To learn more about upcoming class builds, head on over to the Workshops Page. 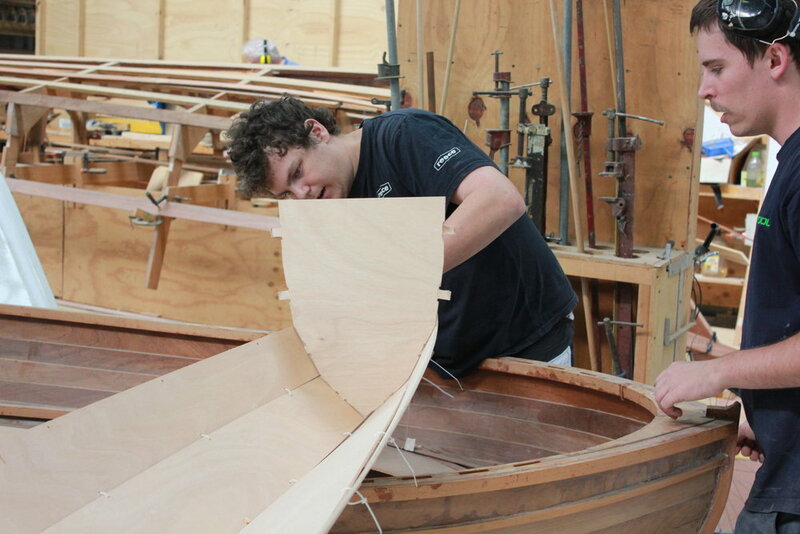 For builders with less time on their hands or who just want to take things a bit slower, our night classes are run under the supervision of experienced boat builders. Clients in night classes start their project with a boat builder who will be there to help and guide them throughout their entire build. Like a personal trainer but for boat building, you pick the boat and then we guide you through the construction process. Night classes are run mostly through the year on a Tuesday afternoon from 5pm till 9pm. Individuals on this program are only granted access to the workshop on a Saturday (all day) and Tuesday afternoon. Places are limited. If at any time you get stuck, need an extra hand or wish to learn a particular technique, one-on-one tuition can be organised with one of our in-house specialists for a time that suits you. Our experienced professionals will work alongside you, giving you any guidance and support you may require. When you rent a space in our workshop, you are also entitled to receive free guidance every Saturday 9am till 3pm. This is general guidance provided to you by one of our qualified shipwrights. They will keep a watchful eye over your project and let you know how you're progressing. You require your own tools and equipment but are given access to work anytime throughout the week.